For more detailed information please look at the English user's manual A136_man.pdf. For signals beyond 7Vss level the internal pre-amplifier has to be bypassed (e.g. LFO or unfiltered VCO signals). Otherwise clipping occurs before the signal processing takes place. Details how to modify the module are available on the A-100 DIY page. Because of mechanical tolerances of the potentiometers and knobs the knob positions may vary a bit from the front panel printing (e.g. "0" is not always exactly the neutral position for "A", "+A" or "-A" with zero amplifiaction). The latest version of the module includes a jumper (JP2) at the top edge of the pc board. This is used to select between DC coupling (installed) and AC coupling (notinstalled) of the input signal. 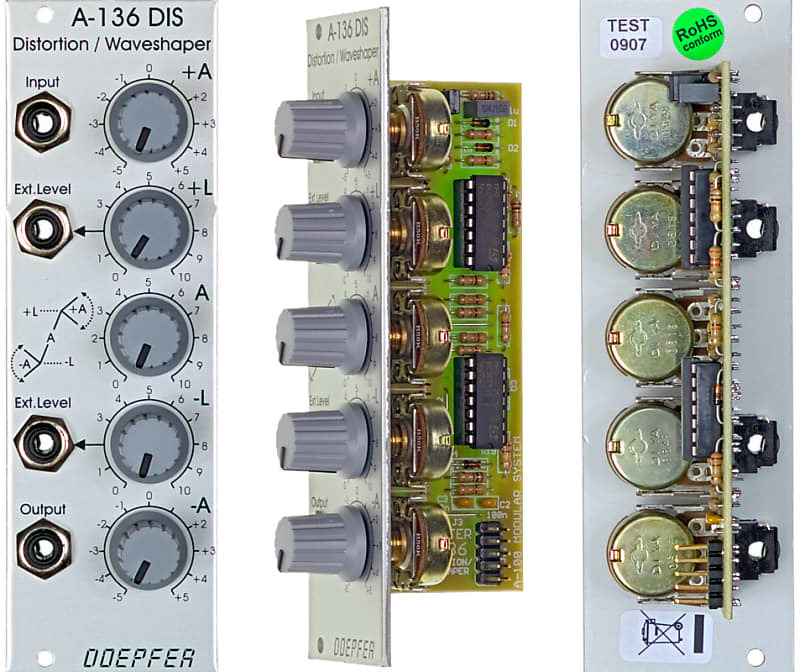 For low frequency applications (e.g. LFO processing) JP2 has to be installed. Parcels shipped ONLY to billing address of credit card or Paypal account. Prices DO NOT include shipping.Customer pays all shipping charges. FEDEX is default if no preference, otherwise UPS or USPS can be done. 48 hour customer approval period allowed on all mail-ordered instruments. Instrument must be returned in exactly the same condition as it was shipped. All shipping charges to be paid by customer.